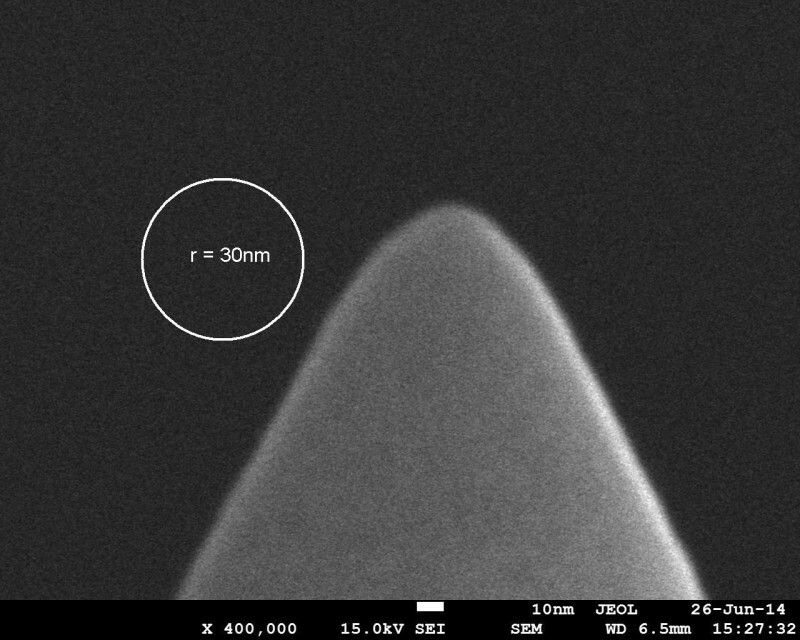 NANOSENSORS has added a new type of rounded AFM tips to the Special Development List. The new rounded AFM tips SD-R30 have a typical tip radius of 30 nm and are available in combination with three different cantilever types. (NCH – standard tapping mode cantilever, FM – force modulation mode cantilever and CONT – contact mode cantilever). Similar to the already established rounded tips of the SD-R150 type the SD-R30 tips are especially tailored for applications such as nanomechanics, examination of local mechanical properties and force spectroscopy. The rounding of the SD-R30 improves the tip rigidity dramatically and allows reliable and stable measurements on hard surfaces over a long period of time. To find out more please have a look at our Special Development List or contact us at info@nanosensors.com.